The Fortress of Babylon dates from early Roman times, when a Roman legion resided in this strategic area on the apex of the Nile Delta. Apparently it was enlarged and fortified by the Emperors Trajan (98-117 A.D.) and Arcadius (395-408). Although the Fortress was sadly ruined at the turn of this century, it is considered to be one of the best preserved military structures of Roman times. Most of the walls are built of three regular layers of red bricks alternating with five stone layers, bound together with a mortar of sand, lime, pebbles and charcoal. The walls were constructed on an irregular five sided layout with numerous semi-circular bastions. The western side facing the Nile had no bastions but featured a drawbridge with two massive circular towers of about 33 meters in diameter, structures not common to Roman fortresses. Now, the gateway leading to the Coptic Museum stands between these two towers. The Greek Orthodox Church of Saint George is built over the north tower. 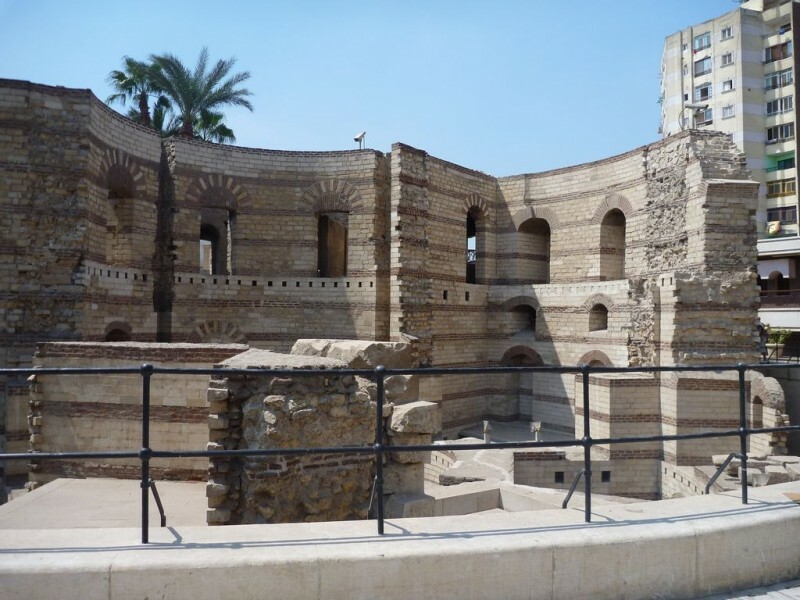 Another gateway facing south is flanked on both sides by two large projecting semi-circular towers leading into an inner court which can be reached from the garden of the Old Wing of the Coptic Museum. It is above this gateway that Church of Al-Mo’allaqa was built. We have no information on the churches within the Fortress of Babylon before the Arab conquest of Egypt. But it is known that Cyrus, Bishop of Babylon, Participated at the Council of Ephesus held in 449 A.D., and his cathedral cannot have been the only church in Babylon. Moreover, beautiful pieces of woodwork dating from the churches of Saint Sergius, Saint Barbara and Al-Mo’allaqa; these are now on display in the Coptic Museum. On the other hand, it seems incongruous that these churches existed inside a fully operational Roman and Byzantine military fortress; one of them, Al-Mo’allaqa, was built above one of the gateway to the fortress.